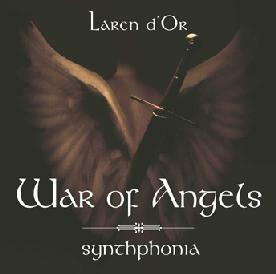 Laren d'Or - "War Of Angels"
Laren d'Or is the moniker used by Hungarian musician Attila Héger, who plays keyboard driven music that is the encyclopedia description of symphonic progressive. Héger has been playing music since he started piano lessons at the age of six, and quotes among his influences such luminaries as Vangelis, Tangerine Dream, Mike Oldfield, Pink Floyd, Genesis, Jean-Michel Jarre, Yes, and Solaris. Vangelis and Jarre are probably the best analogies in terms of the music on War Of Angels, and Héger's compositional talents are without question equal to, if not better, than those more famous artists. War Of Angels is divided into two parts. The first 5 tracks are the "Synthphonia" album and the next 8 are the "Progressive". The Synthphonia tracks are characterized by highly majestic symphonic keyboard works that bring to mind Bach or Wagner gone prog. Bold and intense, the music demands and receives the listener's undivided attention. I kept thinking that he could make a comfortable living doing soundtrack work, and, in fact, the promo material points out that Héger has been the in-house composer for a game developing company for the past eight years. The tracks labeled Progressive start off similar to the earlier tunes but in some cases are rocking out of bit more. The synth patterns have a spacier progressive edge, and are more beat oriented. "Sidestep Walking" is like a heavy symphonic techno piece. Quite a nice set and apparently what I was sent consists of most of the tracks from what is actually a 2-CD set. In summary, Attila Héger will appeal to fans of heavy keyboard symphonic progressive rock. He also has a more aggressive metallic side which can be heard on his Al Norder project (an anagram of Laren d'Or). For more information you can visit Attila Héger at his web site. There are lots of sound files available at his Mp3.com web site. Also check out Attila Héger's Al Norder Mp3.com site.